Note that there are three techniques to implement automatic processes with Better PDF Exporter for Jira. To be sure that the PDF API is the best for you, read the Automation article before this one. 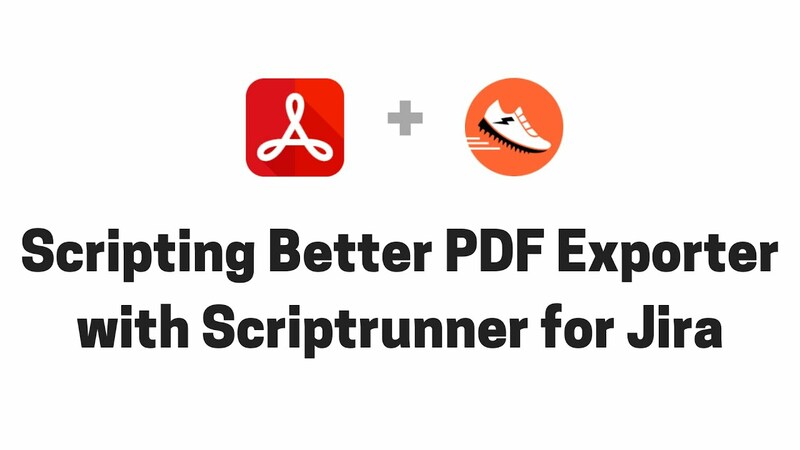 Better PDF Exporter for Jira provides a lightweight in-process API (Application Programming Interface) for the programs that run in Jira's JVM and want to generate PDF document from Jira data. For sake of simplicity, this interface is called the PDF API. Java should be used when building some "really big" app (with its own user interface, model and persistence, and so on), or when adding the PDF document exporting functionality to an existing app written in Java. * This is a convenience method to render PDF documents from single issues. * @see #getPdf(String, String, List, Map) For parameters, see the API call that supports multiple issues. * Renders PDF documents from the passed issues using the specified template. * @param title the title for the resulted PDF document. * @param issues the issues to be exported in the PDF document. * @return the result object containing the PDF document filename and its actual bytes. In the future, we plan to add further API methods, to query the templates defined, to allow creating, modifying or deleting templates and so on. Please contact us any time if you need some functionality exposed through the PDF API. We are happy to help. To make it even easier, Midori provides a small open source integration library for the Better PDF Exporter for Jira. It is called IntegrationUtils, and its aim is to provide ready-made utility functions for the most frequent problems. Functions include rendering PDF documents with a single method call, running a saved Jira filter, sending an email, adding an issue comment and so on. Using the PDF API in Java is simple, as well. For this you should be familiar with the basics of Jira app development. If you could use some sample code or you have some questions, please ask our engineers any time. Please note that there is a similar video available for the companion product called Better Excel Exporter. That video demonstrates the "send Excel periodically" use case. That is a perfect guide to implement "send PDF periodically" even if the file formats are different! After you understood transitions and post function, continue reading the next sections to implement post functions that integrate PDF document exporting to your workflows. Set the name of the template file, the title for document and possibly other settings in the section starting with "// PDF configuration". Jira 6.x: select the Script Post-Function type, and enter the full path of SendIssuePdfPostFunction.groovy to the Script file path input box. Set the path, which specifies the full filesystem path where to write the PDF document to, in the section starting with "// file configuration". Jira 6.x: select the Script Post-Function type, and enter the full path of ExportIssuePdfPostFunction.groovy to the Script file path input box. So, just increase the logging level to DEBUG for the logger SendIssuePdfPostFunction.groovy and you will see what's going on by watching the Jira log. Utilizing these, this section explains how to generate and email PDF documents Jira issues periodically. A typical example can be sending a weekly report as PDF document email attachment in every seven days. Set the username of the user which will be used to run the filter, the ID of the filter and some other settings in the section starting with "// PDF configuration". Enter a descriptive name like "PDF Task Report Sender Service". In the next screen, enter the path of the Groovy script to Input File. This should be something like /path/to/my/services/SendFilterPdfService.groovy. Set the username of the user which will be used to run the filter, the key of the issue and some other settings in the section starting with "// PDF configuration". In the next screen, enter the path of the Groovy script to Input File. This should be something like /path/to/my/services/SendIssuePdfService.groovy.